Together we are about to start down the path of Alternative Beekeeping. Each month I will discuss and share the joys, methods, philosophies, and realities of keeping bees in Top Bars and Warres, along with other different and unique hive styles and methods. There will be times I get straight to the point and other times I will meander about, but always remember - "It’s all about the bees"
There are excellent books for Alternative bee keepers. The selection of Alternative books is smaller then the selection of mainstream bee keeping books. Even then it is difficult to pick a best one. Finding the perfect "first" how to keep bees book is somewhat like trying to find the perfect hive. Beekeeping is so complex and diverse that there just doesn’t seem to be one that can be considered the single perfect book. Even books narrowed down to a specific hive and management style differ in quality of helpful information for a first read. I have an extensive personal beekeeping library containing over 70 books and 12 videos. In the Alternative keeping category I have several books and videos that stand out as what I would consider-"first reads". I think most of these books can be found on Amazon, but I have included a website associated with the author and book. I am not attempting to do a "sales pitch" for any of the books or videos only to help anyone interested in them to local sources for them. "The Thinking Beekeeper" by Christy Hemenway. I consider this book, not only the first read, but as the owner’s manual for Top Bar keepers. Ms Hemenway owns the Goldstar Honey Bee Company http://goldstarhoneybees.com/ . She has written this excellent book for bee keepers starting out with a Top Bar hive. The book is invaluable in that it covers situations and solutions directly affecting Top Bar keepers in our kind of temperate climate zone. "Back Yard Hive, Alternative Beekeeping Using the Top Bar Hive and The Bee Guardian Methods" a video produced by Corwin Bell. I mention a video in a book review because of the level of information in this excellent video. This hour and half video stands alone- I have not found a Top Bar beekeeping video even close to the quality and professionalism of this one. The graphics showing and explaining the life cycle of a colony in a Top Bar hive is incredible. "Natural Beekeeping", by Ross Conrad. For those of you that are considering Alternative keeping in a Langstroth or keeping a Langstroth along with your Alternative hive, this is the book to have in your personal library. 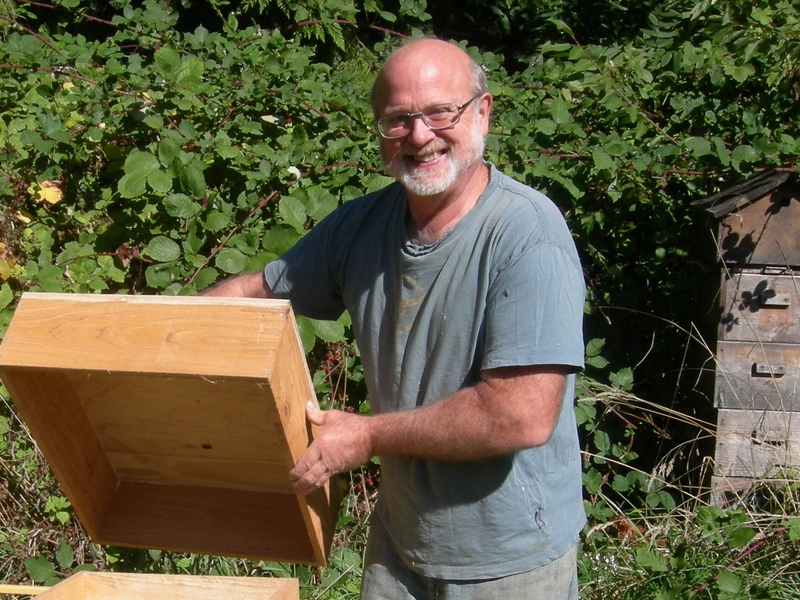 In his book, Mr. Conrad has approached keeping bees in a Langstroth "naturally" as an alternative method of keeping bees. Mr. Conrad also has a video associated with this book which I have not reviewed- yet. Both book and video are available on Amazon. "It’s all about the bees"
What is your Beekeeper Style? 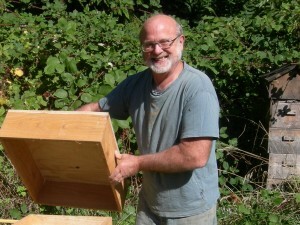 The Buzz from Ernie: A monthly column about alternative beekeeping. What kind of bee keeper are you? What is your bee keeping style? Last month I spoke of the Beekeeper style or style of beekeeping. What’s that all about? Let me start by quoting the famous beekeeper, F.E. Moeller. "Beekeepers in managing or manipulating colonies, are merely facilitating normal biological colony changes to suit their purposes." I can’t think of a simpler way to describe the art of beekeeping no matter what your purpose or style is. Every month I will try to focus mainly on Top Bar and Warre hives, but understand that Langstroth hives can be managed in alternative ways also. All keepers have a strong similarity and bond with each other - their passion for the bees. Over the years I have found a common core purpose that seems to permeate the Alternative keeper’s vision of beekeeping. The desire to be different, hence the name Alternative. We will go so far as to rename what we do as Beehaving or Bee Guardians. Perhaps we have a desire to experience nature at a higher level then we are now. Perhaps a need for a natural connection and keeping bees seems to address it. In this crazy world we live in our bees help us to somehow make that connection. Be it a fascination, a curiosity, a drive, a spiritual connection, or maybe a personal desire to make a difference in the world. Our attraction to these tiny creatures is strong. I find the level of diversity of beekeepers at our club meetings incredible, all with the strong common bond of bees. Even I can only describe much of what I see in the world of bees with my personal feelings of, "It’s magic." However, it is not enough to have strong feelings, along with that passion a beekeeper must have a firm grasp of the concept- "-facilitating normal biological colony changes-" part of beekeeping. Lets start by trying to describe beekeeping styles. This is rather difficult in that sometimes managements and styles will blend and cross over with each other. Every keeper has a different style that ranges from subtle to major differences. It is nearly impossible to describe each and every little difference in styles that sets each one of us apart. The Controller, The Facilitator and The Observer. The Controller - Has a tight schedule. Makes a living with the bees. Much of the management methods involves timing normal biological colony changes with business interests. Desires maximum achievable product production from the bees. Will alter natural colony behavior to obtain keeper desired results. I call my hives managed in this manner The Honey Makers. A good style for choosing the Langstroth hive. The Facilitator - Likes to help the bees. Would like some product from the hive. Will work with natural colony behavior to create some human desired results. Sees beekeeping as a partnership with the colony. Embraces a relationship beneficial for both parties. I personally describe this side of my style as "fussing with the bees" A good Top Bar style of beekeeper. The Observer - Goes with the flow. Views themselves as a provider for the basic needs for a healthy colony. Believes the bees can make a large portion of the choices needed to keep balance in the hive. They are content with the bees just being bees. Bees are considered more pets then product producers. This style of keeping will work well with a Warre hive. A keeper doesn’t have to chose either one or another style. I tend to have a combination of all 3 because I run 3 different types of hives. Even then, I am more of a Facilitator and Observer then a Controller. This is mainly a basic style description to help a keeper choose a hive type most complimentary to their keeping style. Posted on April 4, 2016 June 6, 2016 Author Ernie SchmidtCategories Alternative Beekeeping, ArticlesTags Alternative Beekeeping, Warre HivesLeave a comment on What is your Beekeeper Style? My personal beekeeping philosophy is, "It’s all about the bees". I have kept bees in Warres, Top Bars, Langstroths, and various other hive styles over the years. I love keeping bees in any manner of hive. I have never felt one particular style of hive was right or wrong, better or worse then any other. Bees can and do adapt to nearly any form of cavity that provides the basic needs for them to form a healthy colony. What makes a hive style or management method right or wrong is- what is right or wrong for the keeper. The right or best style of hive depends on the beekeeping style of the beekeeper. Let me make this particular subject a bit more confusing in an attempt to make it clearer. It is possible to blend, mix and cross different hive styles and management methods from one hive style to another. Also in the art of beekeeping there are exceptions to every rule. It is really hard to say, "Bees never do this or bees always do that." As I write about the different hive styles and management methods I will speak in terms of the normally, usually, generally accepted methods of management. Along with the "most of the time behavior" of a healthy colony of bees. The best way to describe the pure definition of "alternative beekeeping" is to explain what it isn’t. It isn’t conventional mainstream beekeeping management methods using commercial style framed hives such as the Langstroth. It is important to know that I have no bias toward conventional beekeeping. I keep Langstroth hives along with my alternative hives. Many times keepers explaining how to use specific hives have biases toward styles they don’t use. There are arguments in the beekeeping world for or against hive styles using a comparison of the hives themselves. That is really more of a comparison of management methods preferred by the beekeepers. When compared side by side each style has it’s own advantages and disadvantages. Trust me, there is no such thing as the perfect hive. It boils down to what kind of hive has more advantages then disadvantages for your personal style as the keeper of the bees in the hive. The absolute best advice, I can give to the first time alternative keeper is to start with your choice of alternative hive and a Langstroth hive at the same time. Understand that your first year of beekeeping is the steepest part of the learning curve. Much of what you learn about bees from your Langstroth is applicable to your alternative hive. The best way to get through that first year successfully is to surround yourself with experienced keepers. Being a member of the local bee club is an important way to find those mentors. Since the majority of the members will have Langstroths it is much easier to ask questions about your Langstroth and apply much of that knowledge to your alternative hive. Things you should be looking for and understanding will be the same in both hives. The bees aren’t different in the two hives only the keepers management of them in either hive. You will be a better alternative hive keeper knowing how to manage a mainstream hive. Do not be fooled into thinking that beekeeping is as easy as putting bugs in a box and waiting for honey. It is like every other form of animal husbandry; it requires specific knowledge of the bees and a level of managerial skill to be successful.